It is one of the representative markets in Korea. 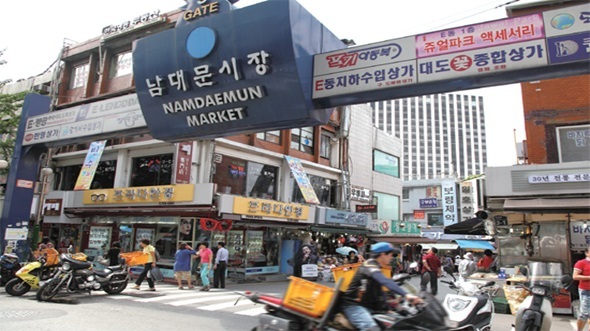 While Dongdaemun Market is specialized in clothing, Namdaemun Market offers various goods related to every day life. There are more than 10,000 stores that are legally registered and street vendors are located at every corner of streets as well. Imported Goods Arcade usually located in the basement is called “Doggebi Market” as it carries almost everything including foodstuffs, liquor, every day items, clothing, bags, shoes, etc. You can find amazing deals satisfying both price and quality as you walk around the market thoroughly. Tableware Wholesale Market is one of the key factors that makes Namdaemun Market popular to shop. It offers a variety of selections ranging from Korean style brassware to all sorts of dishes for all uses. It is recommended to pick necessary items and browse the stores thoroughly focusing on them as Namdeamun Market is too huge with a great number of stores to figure out completely in a day.